A modest Georgian property, in a terrace of similar structures in London’s Mayfair, conceals much behind its elegant brick facade. For this is the private office of the Dyson family, Britain’s most successful modern industrial dynasty. 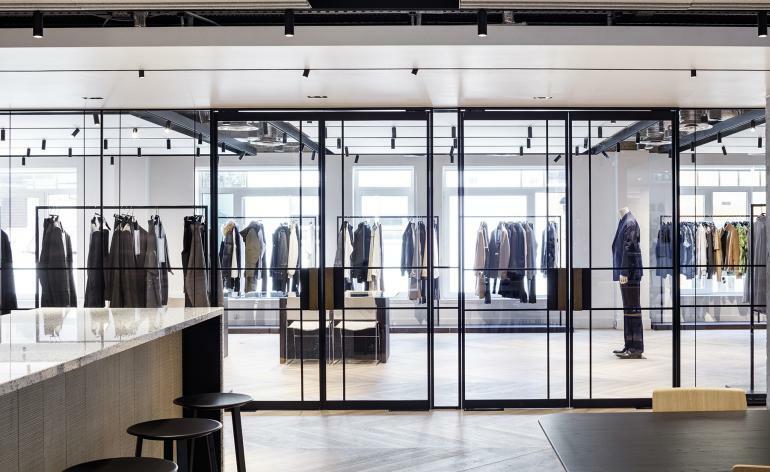 Intended as the nerve centre for all family business, it combines domestic scale interiors with sleek modernist finishes, contemporary craft skills and the latest in industrial design. Sir James Dyson oversees a multi-billion pound business empire, with a vast R&D centre (designed by Wilkinson Eyre) in Malmesbury, Wiltshire, and around 4,500 UK employees, mostly engineers. Manufacturing is taken care of by 5,000 more in factories in Asia. Dyson designs and manufactures vacuum cleaners, hair dryers, fans and lighting, and a much-vaunted foray into personal mobility is currently taking shape. The business has always involved the rest of his family, all of whom have their own creative concerns. This includes his wife, Lady Deirdre Dyson, an acclaimed artist and carpet designer, and their son Jake, who is the company’s R&D director and chief lighting engineer. The creation of the new office, which actually encompasses two adjoining houses, was partly driven by Deirdre. ‘Dyson is very much a family business. We needed a central meeting place for the family, and also somewhere for international meetings to save people heading down to Malmesbury,’ she says. Working with the London-based studio of architect Alexander Martin, she has completed 14 brand new unique carpet designs for the space, liaising closely with Martin’s design team to ensure each individual carpet picks up on colours and details in the architecture, as well as creating related groups of designs on each individual floor. For the architects, the main challenge was balancing the old and the new without giving either a dominant role. ‘It was a tricky planning process,’ admits Martin. The house had been subdivided and ‘messed around with’; many original details were missing or had been damaged during the years it was partitioned into various ffices. Some elements had to be completely rebuilt, such as the staircase; Martin created a precise reproduction (complete with turned-oak balusters and set forward in the hallway so as to conceal a new lift behind it) that services all floors. The top two floors are given over to office space, with lowered ceilings and modern, rather than classical, detailing. The staircase culminates beneath a vast glass rooflight, with a smaller staircase leading up to the neatly concealed roof terrace and its bird’s-eye view of hitherto unseen Mayfair, a landscape of aerials and chimneys. The main boardroom is located in the expansive lower ground floor, which runs beneath the adjoining house and opens up to a small courtyard, with a precisely engineered steel and concrete staircase leading up to the terrace above. ‘We always try to get in as much contemporary stuff as possible,’ says Martin, pointing out the bespoke cabinets for ventilation, AV and drinks storage that occupy each boardroom space. These were made by joinery specialist Howard Bros and helpfully avoid the need for disrupting the proportions or mouldings in the walls and ceilings. The other dominant feature is those bespoke carpets. ‘It gives a domestic touch, as well as some luxury,’ says Deirdre, who has worked her magic on every room, using a combination of tufted carpets made in the UK, and loom-woven rugs made in traditional workshops in Nepal. ‘I tried to make them tie in to Alexander’s interior palette,’ she says, ‘and link a little bit of the colour.’ This task was made all the more difficult as she had to design the floor coverings without sight of the finished rooms. Uniting the entire structure is a bespoke stair runner, with a subtle graded coloration that flows from dark to light. Graded hues also define the freestanding and fitted coverings, which use both wool and silk, with accents of striking Dyson-esque colouring throughout. At the rear of the house, where Martin consolidated the centuries-old jumble of additions with a new garden room above a sunken courtyard garden and a wall clad with wood and copper slats, Deirdre brought the coppery colour into the room’s new rug. The rear garden also contains a lush green wall and an array of cast concrete, lifesize replicas of various Dyson products, which are dotted around like eccentric sculptures (these are developed by the team behind Dyson’s retail stores). The ground floor boardroom features ‘exploded’ Dysons, a set of three products reduced to their constituent parts and hung on wires, Damián Ortega-style. Even more subtle details abound, like the cyclone motifs set into the replaces. The original Georgian plasterwork was cast and recreated with the help of specialists Locker & Riley and Hayles & Howe, and includes a subtle piece of modern decoration, a vacuum cleaner component incorporated into the mouldings. Jake Dyson’s lighting is also used throughout. Dyson junior developed a unique system of infinitely adjustable lighting on slender right-angled supports. Both the Dyson ‘CSYS’ task light and ‘Cu-Beam’ suspended lights use LED technology and special heat-dispersing pipes concealed within the frame. This emphasis on simplicity and elegance, but also the concealment and streamlining of technical function, defines all Dyson engineering. Attention to detail is everywhere and it’s safe to assume that meticulousness is a family trait. In the hall is the Dyson crest, designed by Sir James to incorporate the interests and expertise of this polymathic family, which takes in industrial design, music, the arts and fashion (covered by Emily Dyson Paley’s Notting Hill boutique Couverture & The Garbstore).